A great mid-range option for those with mainly hard floors. This robotic vacuums cleaner posses some very nice features for pet owners… but don’t expect to get the best robo vac out there for this price. Click here to read real user reviews on Amazon. Shark ION R75 is a good mid-price choice for households with pets. You can expect solid cleaning performance on tiled or hard floors, but don’t expect it to do miracles on carpets. It offers app compatibility, and you can start the cleaning from anywhere at any time. Pet owners have also appreciated the low noise level, the self-cleaning brush where pet hair won’t get tangled and HEPA filters that keep the air fresh. 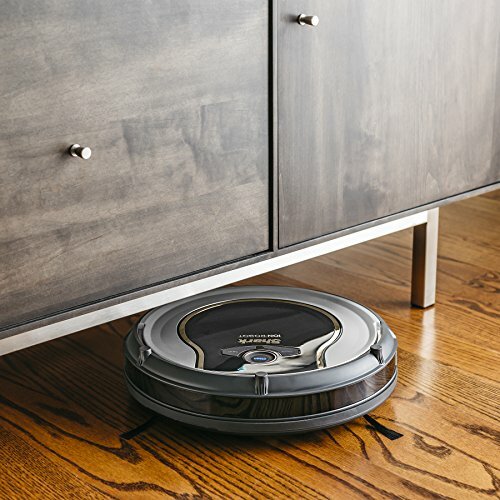 It’s not a self-sufficient robotic vacuum nor a match in performance and navigation to Roomba 980 - but for this price, you can’t expect to get it all. If you’re okay with the trade-offs, this is a good option to help you keep your floors clean from pet hair between more thorough cleaning sessions. 1.5 Summing Up - is Shark ION R75 worth it? SharkNinja is one of the oldest home appliance brands and a well-known company in the vacuum industry. It has been manufacturing reliable and functional vacuums for more than a century. The brand has a steady market share, and their vacuum cleaners are marketed as inexpensive, easy-to-use machines. Against this background, the expectations are high when it comes to their first robotic vacuum, Shark ION robot R75. Does Shark R75 fulfill the expectations? Well, yes and no. 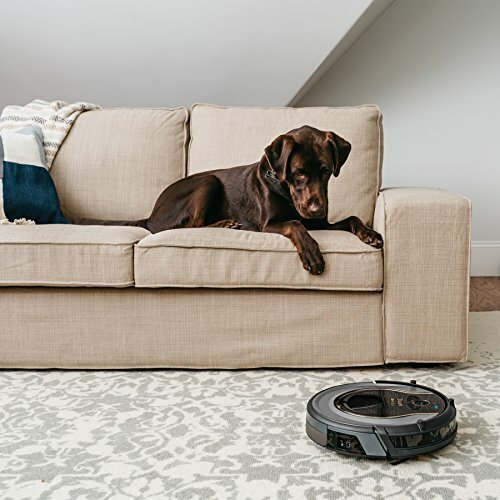 There’s no doubt about it being a great contender regarding performance when it comes to robotic vacuums that can handle pet hair on hard floors - especially if you’re not ready to invest more than around 300 bucks on it. Don’t get me wrong - in this price range, there are quite many robotic vacuums that perform well. The thing is, they usually stumble with pet hair (for example Eufy RoboVac 11), or if that’s not the case, they come second in features (Roomba 690 is otherwise quite identical, but heavier, bigger and louder than Shark R75). However, with this Shark robot, too, you have to be ready for some trade-offs. Next, let’s get into the details and find out the good and the bad there is to know about this robotic vacuum. Most of the robotic vacuums still work either by manually pushing a button on the robot or by remote control. 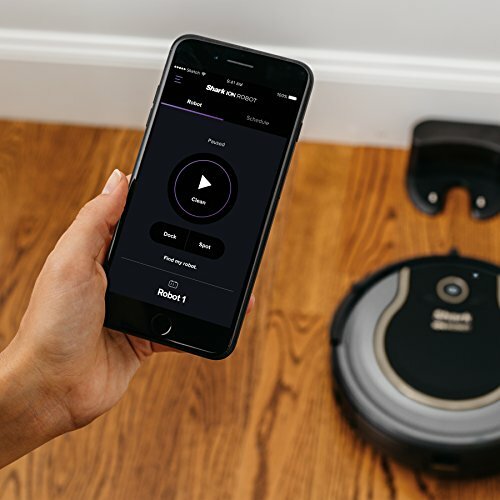 That works fine, but in recent years one by one manufacturers have started to add Wi-Fi connectivity to robot vacuums, which makes using them a lot more convenient. R75 is one of the robotic vacuums, that has this handy feature. However, with this robovac, you’ll have the possibility to use the robot also manually. You can do that by pushing buttons on the top of the robot. Hit ”clean” and the robot will start cleaning the floors or ”dock” if you wish the robot to return to its charging dock. If you need a specific area to be cleaned thoroughly, use the ”spot” cleaning mode, and the robot will clean an area in a spiral pattern. There is no remote, but you can buy one separately if you want. Then again, who needs a remote if you have a phone or Alexa? So, if you don’t want to bend over the robot and physically hit the buttons, you can remotely control your robot by using the Shark ION Robot phone app. The app is compatible with Apple and Android devices. By using your app, you can start and stop cleaning and set recurring cleaning schedules. Also, the app provides access to tips, tricks, and FAQs, as well as maintenance reminders, troubleshooting, and tech support. 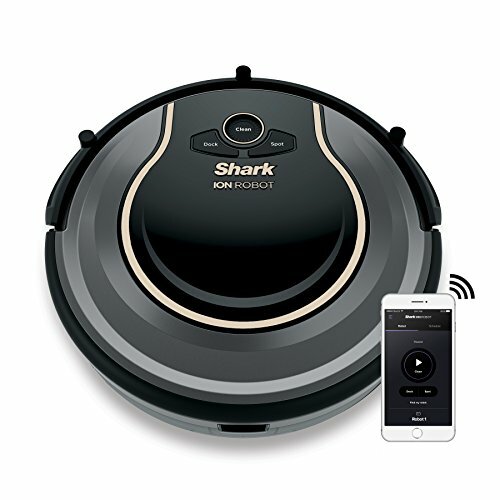 Also, Shark R75 is compatible with Alexa and Google Assistant, so you can just use the voice control to tell the vacuum to start working while you're sitting on your sofa. Pairing with Amazon Alexa and Google Assistant has been said to be effortless. Overall, users of this robot have been satisfied with the app and Alexa, and how they work. The owners have mentioned, that the app is well-designed, aesthetically pleasing and intuitive to use. It is and has been upgraded repeatedly. Also, the possibility to set the vacuum to start cleaning even when you’re not home has been mentioned as a very positive feature. However, some people have reported having troubles with connecting the robot to Wi-Fi, or the robot losing connection with Wi-Fi from time to time. If that should be the case, you can always contact Shark Customer Service, which many users have found helpful. 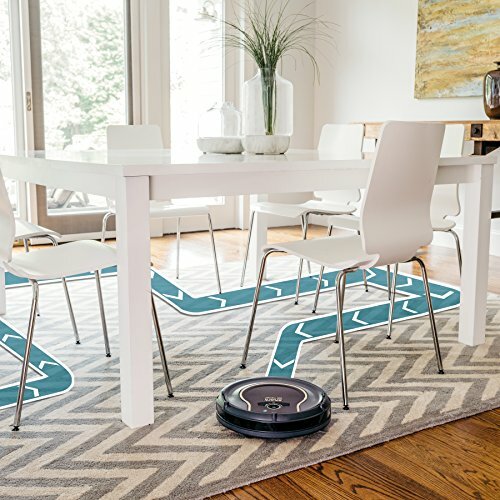 Don’t overlook the navigation capabilities, when thinking of buying a robot to clean your floors. After all, robotic vacuums have to figure out the how to clean the rooms on their own, so they have to be able to cover the floors thoroughly. If they can’t handle this, they’ll likely to leave dirty spots behind and bump into furniture while roaming the floors. According to its marketing materials, Shark R75 promises to ”navigate floors seamlessly while proximity sensors assess and adapt to surrounding obstacles.” In reality, according to its users, the robot performs pretty convincingly when it comes to these promises. The cleaning and navigation pattern seems to be pretty random, which can raise some doubts. However, the results speak for themselves and the algorithm for cleaning seen to be well done. As far as owners have witnessed, the robot covers the floor area without missing spots. 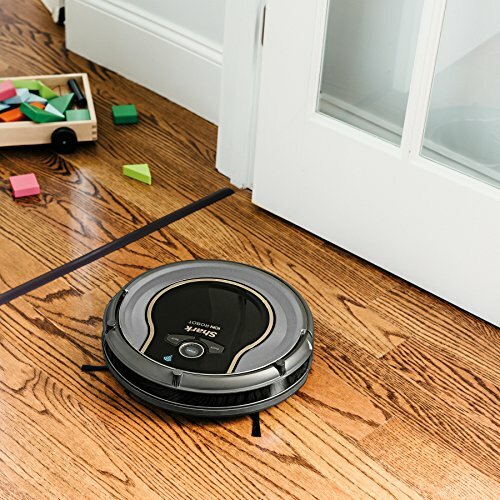 As this robot from Shark is slim at only 2.6 inches (Roomba 980 is 3.6" and Deik 3.4"), it navigates around floors without getting stuck under low-built furniture. This is not a minor thing if you’re ever planning to leave it to clean by itself. It gets easily under most cabinets, sofas, beds, and furniture, so you don't have to worry about coming home and finding your vacuum stuck under your bed with the job unfinished. If you want the robot to avoid certain areas, you can set ”no-go-zones” with BotBoundary (barrier) strips, which come along with the robot. Just place these barrier strips where you want (around your dog's food and water bowl, for example), and the robot won’t cross these strips when it moves around. The strips aren’t visible, they don’t require batteries and don’t have to be turned on – this makes using them super easy. The robot is equipped with anti-collision and anti-drop sensors. The cliff sensors are there to avoid stairs and other steep drops. Users have reported, that the cliff sensor technology is on point and the robot will not fall off any drop-offs. If you want to be super cautious, you can place barrier strips in front of the stairs. 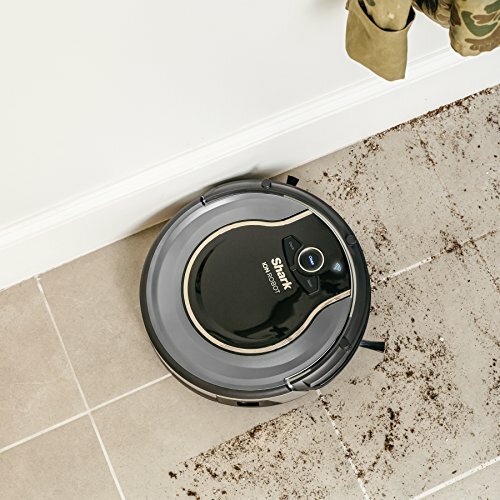 The manufacturer – as well as users of this robot - instruct that you should always check the space that is being cleaned and prep your home beforehand. Look around to see if there are any tight spaces or furniture the robot could get stuck in or under, and check that there aren’t any cords on floors. Owners of this robotic vacuum have also advised others to block any loose cables and wires with the boundary strips to be on the safe side. Having said that, as long as you're ready to do some prepping before sending this robot to work, you won’t need to be there as a robotsitter when it does its job. The truth is that it’s not the case with all the robotic vacuums in the market. Shark has equipped this model with a long-life lithium-ion battery, which has been noted by its users. When fully charged, the battery provides a cleaning time from 60 to 90 minutes. When the cleaning cycle is complete or the battery is running out, the robot will automatically return to its docking station. As long as you set the charging dock with its back against the wall and remove any objects closer than 3 feet from the base, users have reported, that this the Shark ION 750 finds its way back to its charging dock. This feature is not to be taken for granted, as many of its competitors get lost while trying to find their dock. Recharging the battery can take up to three hours. 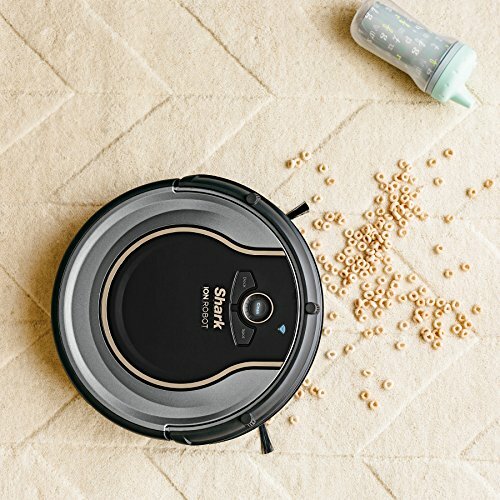 However, as this vacuum won’t automatically resume cleaning after it’s recharged, you may want to consider iRobot Roomba 980 if you’re about to use the robot for cleaning larger areas. If the robot needs charging mid-vacuuming, it will make quite a bit easier for you if it automatically resumes and finishes the job. Even though the battery life is pretty long, in case the battery should need to be replaced, batteries can be purchased from the Shark's website. This robovac posses many features, that are particularly welcome from the pet owners point of view. 1. It’s quiet: when you have pets, the noise of the vacuum may not be a minor point as pets can get scared easily. A nice benefit of this vacuum is that it generates only a low humming noise, which is considerably lower in decibels than what many of its competitors’ generate. Even Roomba 650 or Bobsweep pet hair plus are considerably louder than this vacuum. You can hear it while it’s operating, but you can easily have a conversation or watch TV while it cleans the floors. 2. It has self-cleaning brush roll: This vacuum is equipped with a self-cleaning roller brush, which helps to keep hair from building up and jamming the machine. This means that you have to do a lot less of maintenance work as the self-grooming system releases any tangled hair. 3. The dustbin: The dustbin has its pros and cons. On the other hand, the dustbin is quite small (only 0,3 liters), which means, you have to empty it more often compared to other vacuums with bigger dirt containers. If you have a pet that sheds a lot, it might be a significant problem. On the other hand, the dustbin is easy to remove and empty without making a mess, so emptying it is a quick maintenance task to perform even if you have to do it often. 4. It has HEPA filters: These are the ones you want to have if you have pets. Read more about them from the next chapter. 5. It performs really well with pet hair: read more details from Performance-section. Shark Ion 750 is ideal for pet owners in terms of filtration. It uses HEPA filters, which remove up to 99,97% of particles larger than 0.3 microns in the air; which include pollen and allergens. With pets and all that dander and dust, you want a vacuum that keeps the air as clean as possible. Especially if you suffer from allergies or asthma HEPA filters are highly recommended. The users of this robot have appreciated how efficiently the filter collects dust and how quick it is to maintain. The owners have stated, that the HEPA-filter is easy to take out, to clean by just tapping it and then to place back in. The manufacturer has advised not to wash the HEPA filter with water, as it may damage it and thereby reduce suction power. Shark ION R75 promises to tackle pet hair and in reality – its performance is nothing less than solid. This robot holds two rotating sweepers on either side of the front, which help to capture pet hair as well as other debris from the floor surface. This vacuum is said to get the ”underneath and corners” as well (thanks to its dual side-spinning brushes), which many robotic vacuums sadly seem to miss. Numerous pet owners have said, that this robot picks up pet hair way better than they ever expected. It may not get every single hair, but it catches almost everything and users have been very satisfied with the outcome. It also picks up things like dog food and fine dust without problems. This Shark robot is undoubtedly at its best on hard floors and tiles, but it performs impressively on low-pile carpets as well. Shark R75 helps you keep up with pet hair on an everyday basis. Even though it won’t substitute a full-size vacuum, it definitely helps you keep your home pet hair free and extend the time between heavier cleanings. Pet owners have also appreciated the ability to schedule cleanings, as this feature lets you come to a clean home every day. All you have to do is schedule a time, and the robot will do the rest for you. If you have mainly hardwood, vinyl, tile or another hard flooring in your home, this robot vacuum from Shark is an excellent pick for your needs. It does good work on low-pile carpets, and its performance with medium-pile carpets is satisfactory, too. The high-tensile bristles on the brush roll pick up dirt and debris from the fibers of the carpets and lift them up for the suction to pick up. The key to this is that the vacuums moves quite slowly and gives much focus to all areas of the floor. R75 does basic maintenance cleaning for you, and it’s not designed for deeper cleaning as it lacks the true sucking power to be a real carpet cleaner. To be fair, this is a drawback with almost all the robotic vacuums, not particularly with this model. If you have mainly carpeted floors, thick high-pile carpeting, or if you want a robot that cleans carpets more thoroughly, I’d go for Roomba 980. It is a considerably better match for carpets as it has noticeably more suction power. As written above, this robot does impressive work on all kinds of hard flooring. It is safe to use on laminate floors, tiles, and vinyl. We’ve heard from the owners of this product, that Shark R75 picks up an ”amazing amount” of dirt, dust, and debris while the brushes sweep the floor. Even when the users have thought the floor was clean before sending the vacuum to work, the contents of the dustbin has proved them wrong afterward. Transitions between carpet and hardwood have been said to be smooth, and this robot has not been reported to encounter having any problems moving from hard flooring to carpets or even thick rugs. Summing Up - is Shark ION R75 worth it? This Shark is a nicely performing robotic vac which cleans low-pile carpets and bare floors easily. It will save you a considerable amount of time in housekeeping – precisely what robovacs are meant to do. However, Shark R75 is not perfect. It could have a bigger dustbin, and it’s not the one you should buy if you have mainly carpeted floors. It’s not a robot you could just ”set-and-forget” either, as it’s not as self-sufficient as Roomba 980. Still, it has enough brain to make it around your home without getting lost or frequently bumping into things. Moreover, a big plus is, that it won’t need constant supervision and you can leave it unattended. It has Wi-Fi connectivity and voice activation, and it’s simple to use. It provides most - or even more - features many higher-end robotic vacuums have, and it does so for more than $200 less. All in all, the price is definitely attractive for the features this model holds.